A driving force in the ethical footwear market, Alicia Lai strives to create stylish shoes for both men and women, made of the best innovative, eco-friendly and vegan materials. I was first introduced to her brand “Bourgeois Boheme” three years ago by one of favourite vegan and minimalist YouTuber and I am thrilled to be able to feature her work on my Blog! The extensive shoe collection covers any occasion from stunning and comfortable workwear to pumps, boots, trainers and the EcoStone – the natural stone slate covering heels. Alicia is a bold designer eager to try new eco-friendly materials like the pineapple skin (Pinatex) and the breathable seed-based Bio-polyoils for the lining. Here is what she tells me about the brand and her values. How did you come up with the idea to create Bourgeois Boheme? What drives the consumer demand for vegan brands like Bboheme and the rise in vegan shoe sales? “There is an increasing consciousness about veganism and eco-friendly/sustainable products. At BB, we believe that a good vegan shoe should be about more than just excluding animal materials, so we are passionate about championing slow fashion and challenging the stereotype of leather-free footwear. We create the perfect vegan shoes without compromise of quality, finish, or design. All BB shoes are Vegan Society trademarked and PETA approved. What makes the brand to stand out from the competition? Do you consciously make shoes that will appeal to a wider market (eg. the eco-conscious consumer who is not necessarily vegan) and what are the challenges you face penetrating this market – if any? 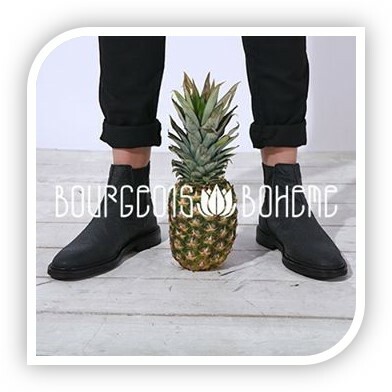 Where do you see Bourgeois Boheme in the future? Are you tempted to design a clothing line or accessories in alignment with your sophisticated shoe collection?